Thomas got a ticket, Sam watched a Weird Owl movie, and some other great stuff. Help us fight off that episode 150 hangover. Thomas went to a wedding in god knows where somewhere super far away. Sam was into Toto after it was cool, but before it was cool the second time. Plus brains are impossible and where in the hell did James Dean die. Then we've got an extra long bonus segment for patrons! Sam has a question about how the hell to be a parent, and Thomas tells an insane story about fighting with their sibling. patreon.com/shoeshine Join the EXCLUSIVE facebook group! https://www.facebook.com/groups/weaselstronghold Make sure to answer the question to get in! Sam has a harrowing tale of trying to do a normal human interaction. His longtime employee is leaving to move across the country. How does he cope? Also Thomas was poisoned. Then Sam has a really depressing segment on whether or not you want a dead body. Body or no-body, vote on Twitter. After that, head over to patreon.com/shoeshine to hear about Thomas having seen Hair the musical. Sam's got a tale to tell of crappy people and then we end up talking about the Staircase a lot. Turns out the brothers disagree pretty adamantly on whether or not the guy is guilty. Then in the patron only bonus we've got a softball update! Is recycling real? Plus Sam's UPS troubles, Thomas's baby birthday party stuff, and some music reviews that you'll probably resent! After that, a nice weird bonus for our patrons! The dudes went to a family wedding and got some good dad talk in with their half brother. He's the only one really still talking to him. Anyway the wedding was great but intensely catholic. Like amazingly catholic. Sam tried to burn down his house and add to the plethora of California wild fires. Thomas has some really important points to make about dental hygiene. Also, Thomas reviews a curious oldie. Sam's cast is offffff but there's a catch. There's always a catch... Thomas has some TV confessions to make and then they talk about the weird kite festival that Sam apparently went to. We've got some funny stuff and then also an extensive analysis of why Last Chance U is some of the best TV on Earth. It's an extra long show too with some dad talk at the end. Sam's got some more hilarious tales of fast food eating, which makes sense since it's pretty much all he does. Then Thomas has a few tips on how to make soccer not the worst possible sport of all of them. Then patrons get a hilarious bonus extra segment! Sam's got some tales from the crypt he saw in San Diego, and Thomas doesn't have to do as much for once this week thanks Sam. Patrons over at patreon.com/shoeshine get a nice long bonus segment! The dudes talk idioms, painting, fast food, bridges, and whatever just listen to the stupid show. Thomas's life really was ruined by Robby Glantz, and Sam broke his hand and is dying to tell the story repeatedly. In the bonus segment for patrons, Thomas has a review of Netflix's Evil Genius! It's a miserable episode about both hot and colds. And some other stuff. It's great. Listen. Take a look at the featured picture and tell me that's a f*cking cat. Do it. Anyway we've got talk of arguments with our wives over nothing, and also we saw Chris Cohen! It was weird. That's a lot of things tied together, you'll have to listen to untangle it all. Also, in the bonus stuff for patrons, Thomas has a really weird series of vivid memories about substitute teachers who were f*cking weird. You need to check it out. patreon.com/shoeshine. If what you've been missing in your life was more stories about eating too much fast food, we've got the show for you. Sam finally meets his McDonald's best friend, and Thomas has a theory on why lines are taking forever. Also some New Orleans observations. Sam's got all kinds of tales from his road trip with his son including cowboys, mechanical bulls, and #1 overall NFL draft picks. Thomas has a couple of whatevers but mainly it's Sam's time to shine. Thomas has some thoughts on being a naked robot in Westworld, Sam has tales of giraffe disposal and how we're all in a zoo and people can't think clearly. 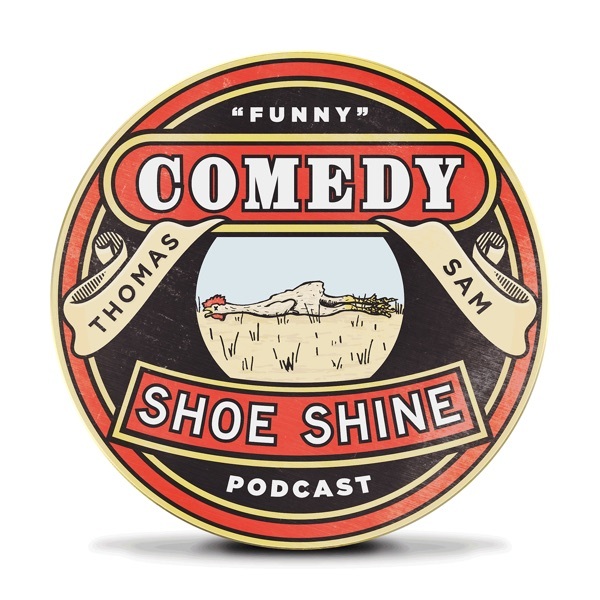 It's Comedy and it's a Shoeshine. It's a Comedy Shoeshine. It's a rare recording in which the brothers Smith are in the same house for some reason. We've got a couple commercials to make fun of including the best commercial ever and the most average commercial ever. Also what if aliens landed on Earth. Then for patrons, we've got a nice extra long bonus segment! Head over to patreon.com/shoeshine and pledge virtually nothing and enjoy that bonus extra!